A photo shows a Facebook site that features one of India’s most wanted, Hafiz Saeed, the founder of Lashkar-e-Taiba, a banned organization and a U.S. declared terrorist group, in Islamabad, Pakistan, July 7, 2017. Pakistani authorities this week confirmed the country is going back on the "gray list" of the Financial Action Task Force (FATF), a global financial watchdog that monitors terror financing and money laundering. The country's status has been unclear for weeks, as Pakistani authorities lobbied the FATF that they have taken adequate measures to curb terror-related financial crimes in the country. But they acknowledged Wednesday that those efforts apparently had failed. "Pakistan will be assigned to the gray list in June, once an action plan has been mutually negotiated," Muhammad Faisal, Pakistan's foreign office spokesperson, told reporters Wednesday. The decision to add Pakistan to the terror watch list was made during FATF's meetings last week in Paris, where representatives of different member countries and international organizations convened to discuss the issue. Pakistan fears the designation will hurt its economy, deter foreign investments and take a toll on its access to the international financial markets. This is not the first time Pakistan will be added to the FATF's terrorist watch list. Pakistan was on the list from 2012 to 2015. The recent designation follows a motion introduced by the United States, along with France, Britain and Germany, alleging that Pakistan has failed to adhere to the FATF guidelines on terror financing and anti-money laundering regulations. Lisa Curtis, a United States National Security Council official, visited Islamabad following the FATF decision. "There has been a longstanding concern about ongoing deficiencies in Pakistan's implementation of its anti-money laundering/counterterrorism finance regime," she told Pakistani news media. Terror financing remains a major concern and challenge in Pakistan, where militant groups allegedly raise money under the guise of religion and welfare for the poor and instead spend it on terror-related activities inside Pakistan, and in India and Afghanistan. In response to growing international pressure, Pakistan did take measures against some of these militant groups and their financial sources, but apparently the actions were not viewed as adequate by FATF. Last month, the country amended its anti-terrorism law that allows the government to blacklist charity organizations linked to Hafiz Saeed, a U.S.- and U.N.-designated global terrorist. Saeed is believed to be the alleged mastermind of the 2008 Mumbai attacks that claimed more than 160 lives, including of six Americans. 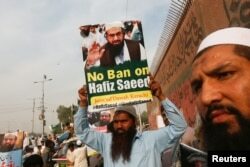 FILE - A supporter of Islamic charity organization Jamaat-ud-Dawa (JuD) carries a sign during a protest in Karachi, Pakistan, Feb. 3, 2017. Jamaat-ud-Dawa (JuD) and its subsidiary charity organization, Falah-e-Insaniat Foundation (FIF), are considered terrorist organizations by the United Nations and the U.S. State Department. Both organizations led by Saeed have fundraising networks in Pakistan. U.S. State Department spokesperson Heather Nauert raised the issue again last week. "How many times have we talked about the person who Pakistan let out of house arrest, who was responsible for the Mumbai attacks back in 2008 that killed so many people, including Americans, too?" she said, referring to Saeed. Washington suspended $2 billion worth of aid to Pakistan last year, and is pressuring Islamabad to cut its alleged ties to Islamist militants waging war in Afghanistan and India. Pakistan denies the charges and maintains that it has carried out military operations against terror groups throughout the country indiscriminately and that there are no terror safe havens in the country.